If you require a more customized program or prefer a private setting for your training, we offer one-on-one sessions. Based on your fitness level or physical capacity, we design workouts for you with exercise options that will progress as you do. Having worked with clients from all walks of life, we are able to address your specific needs and concerns with knowledge and experience you can trust. 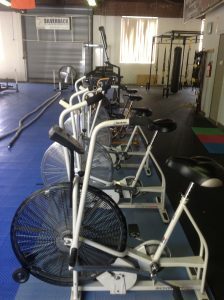 Silverback Fitness also offers personalized small group trainings and workshops by request. In addition, we have access to some amazing resources if your needs lie beyond the scope of the professional fitness training. We’re here to help you LIVE YOUR BEST. Comprised of a high-intensity mixture of strength and cardio, utilizing all types of training modalities, this class is like no other. Both physically and mentally challenging, this format is never the same and blends all effective training for unmatched results. Ideal for those new to our programming, Cave Basics is an instructional format which builds a foundation for the skills, drills and techniques used in training sessions offered at Silverback Fitness. We explore and break down the components of Olympic lifts, strongman techniques, bodyweight exercises and other modes based on assessment of each client by the instructor. The asymmetrical design of the kettlebell makes it a more effective training tool. The abdominals and stabilizing muscles spring into action as we complete functional movements useful for everyday activities. All of these total body moves teach the body to work as one unit, improving balance and coordination, along with strength and endurance. Developed at Silverback Fitness, this dynamic interval format integrates segments of cardio, strength and core training that keeps you moving! Youll get it all done in 30-36 minutes, making this class a perfect option for every fitness level, and those looking for a workout on alternate Cave Training days. Born in the Navy SEALs, suspension training bodyweight exercises develop strength, balance, flexibility and core stability simultaneously. The TRX is a portable training tool that leverages gravity and the users bodyweight to complete 100s of exercises. This fitness boxing/striking class blends traditional fight sports training with High Intensity Interval Training (HIIT). ALL levels are welcome! You dont have to be a pro to train like the one. Originally developed for Israel Defense Forces and Israeli security forces, Krav Maga is a reality based self defense system which is extremely effective and easy to learn. Not only will you learn a real-world skill set, you’ll get an amazing workout at the same time. This class is taught in partnership with the Academy of Christian Martial Arts and Fayetteville Krav Maga.